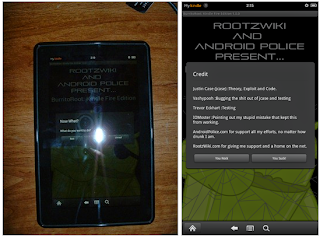 Seeing the issue, Justin Case got right to work; and after a night's worth of coding, with a group of fellow devs helping him through the testing process (namely, Vashypooh, Trevor Eckhart, and IOMoster), he developed a new method to root the Kindle Fire -- a method that works not only on software 6.2.1, but on all currently known versions of the Fire's OS (future updates make break this). Better yet, it's not a hacky process at all; in fact, it's quite simple. Shall we begin? ADB up and running on your PC. BurritoRoot may not work on version 6.0 firmware. If you're having trouble, update your firmware and try again.